On this page you can learn more about extension springs, determine which replacement extension springs you need, and see how to order springs. These springs are for sectional garage doors. If you have a garage door that does not bend as it rolls up into the horizontal tracks, if it is one rigid piece that pivots, go to our One-Piece Garage Door Extension Springs page. » Replace One Spring or Two? Sectional garage doors are hinged and they bend in the tracks as the door opens and closes. Many of these doors are counterbalanced with extension springs, also designated "stretch springs," and they have seven characteristics. The length is the measurement of all the coils pressed together. This, along with the inside diameter of the coils and wire size - the thickness of the wire from which the springs are made - determine the stretch, the distance the spring is extended - normally half the door height, and pull, the force the spring pulls when stretched its normal length. The type of ends determine how the ends of the spring are mounted. The initial tension is the percentage of pull needed to separate the coils. This is determined by the pitch with which the springs are wound. On sectional garage door springs this is normally 15 percent. For example a 100 pound pull spring requires 15 pounds of weight to separate the coils; when a door is open the two springs will support 15 pounds of door weight without any stretch. Most extension springs are made of oil tempered wire. These are normally coated or painted. Some springs are made of galvanized wire. 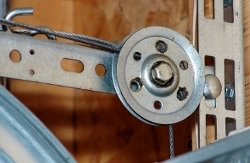 Garage door extension springs counterbalance the weight of garage doors to make them easy to open and close. One end is secured to a stationary angle or bracket, and the other end is pulled by the weight of the door. On the 100 pound door in our example above, there is one extension spring for each side of the door. Each spring pulls 100 pounds on the pulley, but the cable on the bottom of the door lifts only 50 pounds. This is because only half the tension from the spring is transferred to the door; the other half of the spring tension is transfered to the other end of the cable where it is secured to the horizontal track angle with a cable clip and an s-hook. As a result, the 100 pound door in our example needs a 100 pound pull spring on each side of the door. Notice also that the spring stretches from 25" to 67 inches. This difference of 42 inches - half the door height - is the spring stretch. 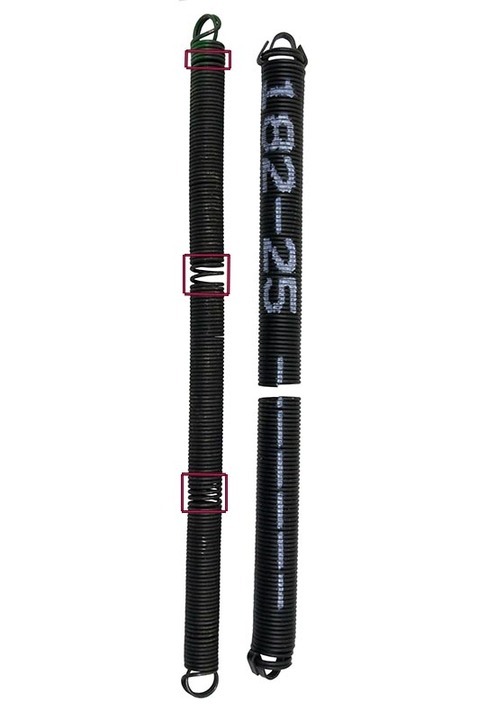 This spring would be designated 25-42-100 because it is 25" long, it stretches 42" beyond the 25" length, and the 100 is for the 100 pounds of pull on each spring. Thus, for a seven foot high garage door that weighs 100 pounds, the door would require two of these 100 pound pull springs. Quite often the loop breaks off the end of an extension spring. There are two options for fixing the spring without replacing it, or for making your door operational until springs can be ordered. One is to separate the last two coils with a screwdriver and attach the s-hook or eye bolt. The other temporary fix is to install a clip at the end of the spring. You can buy these at our extension spring hardware page. Bear in mind that these are temporary fixes. You can expect your spring to break again at the other end or at another place along the length of the spring. The only reliable repair is to replace both or all four springs. It is important that you replace your old extension springs with new springs that will properly match your door weight. This will provide you with a properly balanced garage door, one that will stay on the floor when it is closed, stay halfway, and stay up when you open the door. The blog is written for torsion springs, but testing the balance of a door is the same for both systems. Broken pulleys and cables frequently accompany broken extension springs, so you may have a slightly bigger project on your hands that you anticipate. There are three important pieces of information that you will need to get in order to select the proper springs for your garage door. These are the door height, the spring length without the loops, and the door weight. If you can identify the manufacturer and model number you may not need to weigh the door. Just click the "Find by Model Number" tab below. One method for weighing a 16' or wider door is to slide your scale under the end of the door on the side that has a broken spring. Raise the other side to the same height and then support it to keep the door level. The door weight can be difficult to calculate. You must use an analog scale, as most digital scales do not respond to a changes in the door weight caused by the door binding in the tracks. If you have two broken extension springs, slide an analog scale under the center of the door to get the total weight. If one of your two extension springs is broken, you can slide the scale under the door under the side with the broken spring as pictured to get half the weight. Shake the door and check each of the rollers for binding. If one spring is broken, the weight you read off the scale at the broken will be 1/2 the door weight. If you have a total of two springs on your door, and if both springs are broken, the scale will read the total door weight. For more information, see the first five steps of our Extension Spring Replacement tutorial. If you have a total of four spirngs on your door with two springs on each side of your door, open the door, remove the second spring on the side with the broken spring, and lower the door onto the scale on the side that had the broken spring. With both springs off on this side, you can double this weight to determine your total door weight. It is important to note, however, that since you can't weigh the door at the very end, you will need to adjust your weight to factor in the distance from the end. For example, if the center of your scale is 12" from the very end, you will need to add to the weight your scale shows. A percentage determined by dividing 16' by 15' arrives at 106.66% per cent. Hence a weight of 100 pounds X 106.66% = 107 pounds. Double this and the total estimated door weight should be around 214 pounds. This door would use two 210 pound lift extension springs. Or, if the door has four extension springs, the door would use two 100 pound lift springs and two 110 pound lift springs. A more accurate method for weighing either a torsion spring door or an extension spring door is on our YouTube channel. The door height also helps to determine which springs you need. For example, the extension springs made for 14' high doors are intended to stretch twice as far as the springs made for 7' high doors. As a result, the un-stretched length of an extension spring generally increases as the door height increases. Another measurement you will need to make is the un-stretched spring length, not including the ends. Extension springs tend to stretch over time so you will need to remove the spring from the door and compress the coils when measuring the length. You may need to insert a shaft in the middle of the spring to keep it straight while compressing the coils. Some springs are ruptured so badly you may need to measure and count coils to calculate the length. While the door industry has standardized on spring lengths, there are multiple spring lengths for some of the more common door heights. If you decide to purchase an extension spring with a shorter un-stretched length than your old spring, you will need to adjust your cables. There will need to be 2" of additional length for every inch that your new spring is shorter than the old spring. If your cables are not adjustable or are too short, you will either need to replace the cables or order a longer spring. 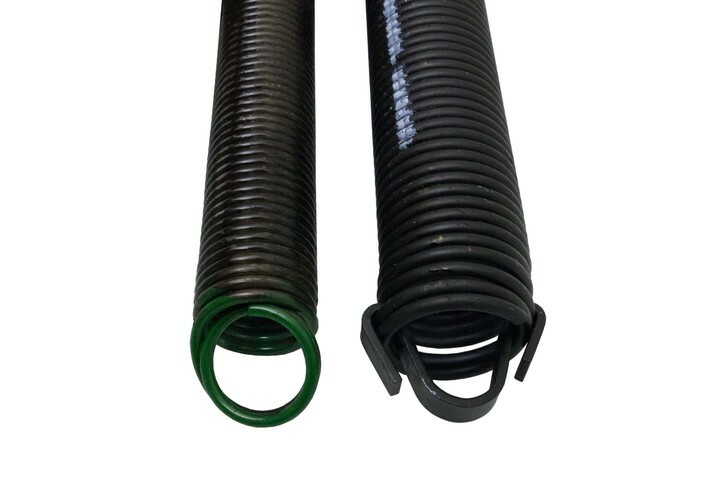 If you need a spring with dimensions not listed in our parts catalog, we can order a custom spring. These generally cost about 50% more than our standard springs, so it is probably better to change the cables instead. If your new spring is longer than your old spring, you will need to adjust the cables to shorten the pull. Sometimes this requires mounting the S-hook on the new springs closer to the garage door. Light Blue - 90#, 190# & 290#. This pattern is repeated through all the lifts. From front to back: Open ends, double-loop ends, and clipped ends. There are three types of ends on extension springs and each of the springs has their own advantages and disadvantages. Open looped ends are the easiest to replace. You will not need to open the eye-bolt, and you will not need to disassemble the pulley. One disadvantage, though, is that the whole spring relies on open wire at the end. If this is the only part of your spring that breaks, you may be able to save a few dollars and some time if you put a clip on the end of the spring as we show above. Double looped ends are more sturdy than open loops, as there are two coils of the spring that connect to the eye-bolt and the pulley. One disadvantage, though, is that they take longer to replace. Clipped ends are even more durable than double loops. The spring clips put less stress on the spring ends to help lengthen the life of the spring. These come standard on extension springs for doors that weigh 200 pounds or more. The disadvantage, though, is that they can be more difficult to replace. Replace One Spring or Two? We recommend that you replace all of the extension springs on your door. As the springs fatigue, they loosen and do not provide as much lift as the new spring. If you only replace one of two springs, the door may open unevenly and cause problems such as binding or rollers coming out of the tracks. Worn pulleys can cause problems, and it is good to replace them while you are changing your extension springs. Extension spring pulleys wear out frequently and sometimes they need to be replaced at the same time as the springs. We highly suggest that you check the status of your four pulleys. Since each pulley on your door experiences about the same amount of wear each time the door opens, we suggest that you replace all four of your pulleys if you find one that is worn. This will also save you time in the future and it will save on shipping costs. Extension spring cables cables wear out very often with the springs. If you examine your cables right now, you may not see any problems. Many times, though, the cable is frayed or worn in the cable clip, and the cables need to be replaced. This is something to consider when looking to purchase new extension springs. If one of your cables is frayed or rusted, we suggest that you replace both cables. This might save you the trouble in the future. The prices for the cables for other door heights are determined by the length of cable needed. Safety cables are very important to have on extension spring doors. You typically will not need to replace these cables, but if you do not have them, you should consider purchasing them. The cables run through the length of the spring and contain the pieces of the spring when it breaks. These protect people from injury or death, and they protect cars and other valuable items from being damaged when the spring breaks. All of these parts and more can be purchased on our extension spring hardware page. See our how to order section below for help purchasing your extension springs. Notice below the two tabs for selecting extension springs. Order by Door Weight. If you know your door weight, click the "Find by Door Weight" tab. You will then select the number of springs on your door, the door height, the spring length, and the door weight. You'll notice that the menu provides lifts in 10 pound increments. If your door falls between two door weights, select the lower weight. For example, if your door weighs 168 pounds, select two of the 160 pound lift springs. It's better to go under than over so the door stays down when closed and up when opened; stronger is not better. The cable and pulley system limits the amount of adjustment if the springs are too strong for the door. After you click "Go!" a new page will appear with up to three options for spring ends: open loops, closed double loops, and clips. You'll also see the spring part number, length without the end loops or clips, the spring weight, and the lift or pull of each spring. You'll also see the unit price of each spring. If you have more than one door you can save on the price of the springs as well as on the shipping cost. If a long life spring is available it will appear below the first option or options above. Next, you can then click the part number for more information, and then click "Add to Cart." Or, you can simply click the "Buy" button and then follow links to purchase the springs. Order by Model Number. Most of the newer garage doors have identifying stickers that designate the manufacturer and model number. If you have this information, click the "Find by Model Number" tab. You will then enter the manufacturer, model number, door dimensions and additonal information to help you order the correct springs. Click "Go!" Long life extension springs like the one on the right last about three times longer than the one on the left. Longer Life Extension Springs are now available. In our tests here at DDM Garage Doors, Inc. we have found that the standard cycle life springs start to gap at just over 7,000 cycles. These will usually work beyond 10,000 cycles, but only after additional gapping or until the spring breaks. We also found that at this point the springs are gapped an extra inch or so. Three problems occur as a result of springs gapping. Extension springs often fatigue before they break. Others just break without warning. The spring on the left has fatigued and stretched at 10,000 cycles; the one on the right is a long life spring that broke after 28,000 cycles. One is that the springs lift about 10% less. On a 200 pound door that is about 20 pounds, and if the opener force is properly set, the opener will stop lifting the door just after it starts. A second problem that frequently occurs is that when the door opens, the cables loosen and fall off the pulleys. When the homeowner tries to close the garage door it jambs and reverses. Often the stretch can be adjusted, but tests have shown that after springs get multiple gaps they will continue to grow an inch or more every 1,000 cycles. They are also more likely to break, causing damage to hangs and pulleys. Even more extensive damage is possible if there are no safety cables on the door. A third problem with expired extension springs is that one side fatigues before the other. When this happens one side pulls up before the other and the top section hits the pulley or mounting bolt, causing the door to stop. This is also why we discourage customers from buying only one spring. The door will not open or close evenly causing additional problems with wear, binding, and with rollers coming out of the tracks. The primary advantage of longer life springs is that since they normally last about three time longer than the standard springs, you may never have any of these problems. If you do buy the springs we do recommend you reinstall your safety cables or buy new ones if you don't have any. If long life springs are available in the sizes you need the option will appear with part numbers ending in "LL" in the in the list that appears after entering information in the drawdown menus. One Final Note. In the early decades of door manufacturing springs were often much larger than the standard extension springs made today. Older springs also fatigue and grow in length. Because of this a 25" spring that has stretched five inches will measure to be 30" if measured while the spring is still on the door. For these reasons, and because there are no standard engineering specifications among the spring manufacturers, your new extension springs will likely look different than your old springs. This is normal, and, assuming that your new springs are for the same door height and that they have the same pull as your old ones, you can expect them to be fully compatible. 2. Door Height - Select - 6' 0" 6' 6" 7' 0" 7' 6" 8' 0" 9' 0" 10' 0" 11' 0" 12' 0" 13' 0" 14' 0"
Note: The spring options given are based on original door weights. Hurricane bracing, decorative hardware, and other additions to the door may alter the door weight, rendering the suggested springs unuseable. The model number search does not cover all door heights. If your door height is not given, please use the "Find by Door Weight" tab. If you want us to check your calculations before ordering, you can contact us with your door weight, the total number of springs on the door, or any door information such as manufacturer and model number that you can find.